It looks like September 2014 shall forever more be known as Saffron Month in the world of Australian craft beer, with Bendigo’s Brookes Beer and Abbotsford’s Moon Dog decided that for too darn long have drinkers been denied the chance to sample the spice obtained from the stigma of a crocus flower in their beer. 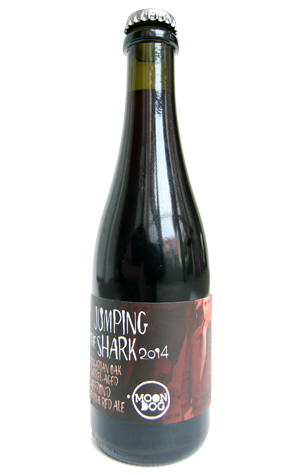 Although for lovers of Moon Dog’s unique brand of experimental, high ABV madness, it will more likely be remembered as the month that “Ayyyyyyy!” returned as The Fonz reappeared on their labels to mark the arrival of the second annual Jumping The Shark release. It has rather large footsteps in which to follow, given we were inspired to declare 2013’s barrel-aged, heavily truffled, 15.4 percent imperial stout their best yet and said beer then went on to win the brewery’s first Australian International Beer Awards gold medal. So, what’s 2014 all about? Well, again, it’s a beast of a beer: 14.1 percent of beast to be precise. And it’s spent time in barrels again: one month in medium toast Hungarian barrels to be precise. It’s an imperial red ale, one that uses a Belgian yeast in the mix, as well as half a kilo of the aforementioned saffron. Given the last of these is often used as a food dye it should come as little surprise that the beer has a distinctly deep red, russet hue, topped off with a steepling copper head and thus looks pretty glorious in the glass. Most noticeable on the nose are some Trappist like banana-y esters alongside all manner of sweetness – honey, treacle, Devonshire clotted cream fudge (should a 14 percent beer spark memories of tooth-rotting childhood addictions…?) as well as, unsurprisingly, some booze. There’s much that reminds us of Amaretto too, particularly running through the syrupy, mouth-coating body that wraps up with a drying, almost tannic bitterness. It’s warming too (although that probably goes without saying) and a beer that, if you can resist, will no doubt mellow with age.